This movie is sick. If it wasn't for the fear of being crushed to death by a 50 foot wave, I would move to Hawaii and start big wave surfing tomorrow. I watched Riding Giants last week and every day since then I have been sitting in my cubicle at work searching the net for Jaws footage. This is easily the best surfing movie ever, and probably the best documentary of the year. This is the most impressive movie about surf, focused on giant waves. It shows the sport on the historical prospective supported by excellent remarks made by alive surfer legends. I met Laird back in 1984 when he moved into the condo next door during his brief fling at modeling for the now defunct Surfbreaker clothing line in southern orange county, CA. Even back then at the age of 20 or so, you could tell he was destined for something great in the surfing world. He was not only in awesome physical condition, but was was easy going and friendly to those he met...and you could see he lived to surf. Now to the film... if you are interested in the history of Big Wave surfing, you HAVE to get RIDING GIANTS! It starts with a brief history going back hundreds of years and works up to the 40's and 50's with some great footage of all the greats who made this sport what it is today. There are not only unbelievable action shots of HUGE waves from that era, but the still pictures and interviews with the legends are in themselves worth this movie. Fast forward to the culmination of all that went before, with an amazing shot of Laird catching the most perfectly shaped HUGE heavy wave you've ever seen (Tahiti)...BUY this movie, its a must for anyone who loves the ocean! Listening to Greg Noll talk as old man about his relationship with the giant waves who every once in a while will wink at him is so powerful it almost takes your breath away. This movie is completely captivating and portrays the roots of surfing in a very personal way. Its just something these guys did, something no one else had done and they just did it without thinking about it - and big wave surfing was born. Makes me wish I could surf. This is THE movie for people who are fascinated by big wave surfing. As this documentary unfolds, what grips you is the crystalline purity with which these men and women pursue the thing that makes them happy; makes them feel, at least for that one moment when they skim atop a liquid volcano, absolutely connected to everything. My favorite surfer, among many great legends and personalities, was Jeff Clark, who surfed the towering, icy, rock-strewn waters of Maverick, California for fifteen years by himself before anyone seemed to know it was there. This is, to paraphrase Jeff Spicoli, a bitchin' movie with some tasty waves. It starts with a history of surfing and proceeds to cover the early big-wave surfers in Hawaii from the 40's and 50's and moves to California where the action shifted in the 60's. The section on Mavricks in Northern California was especially good before ending back in Hawaii with present-day monster-wave surfing legend Laird Hamilton. The photography is absolutely stunning making you go, like, "Whoa, dude! How they get that shot?" The interviews with both old and current big-wave riders were well done, very entertaining, and quite informative. All in all, a masterful movie, even for non-surfers. Stacy Peralta's "Riding Giants" is a worthy successor to his groundbreaking "Dogtown and Z-Boys". Worthy, but not as important, simply because he's not covering a story that's gone untold as he did before. When Peralta did "Dogtown & Z-Boys", he was not only documenting a moment in time that was unknown to most outside a small niche culture, it was almost forgotten by the current generation of skaters who owed many of their moves & attitudes to it. This made "Dogtown & Z-Boys" not only an enjoyable documentary, but an important one as well. "Riding Giants" covers ground that has been partially covered before, most recently in "Step Into Liquid". What does set "Riding Giants" apart from the pack of surf documentaries are never-seen archival footage & photos from the late 1950's, shot by one of the original big-wave riders, Greg Noll. The shots of Hawaii's North Shore nearly 50 years ago are amazing; no hotels, no crowds, hardly any roads. Noll & his compadres were true trailblazers into this unknown frontier. A highlight of the film is the Mavericks section. The home movie footage spotlights how courageous Jeff Clark was to surf this gnarly, cold brute for 15 years by himself. Although Clark downplays the bravery displayed by categorizing Mavericks as his "refuge", when surfer Mike Ho is killed his first day there, the danger is made clear to even the driest couch potato. My favorite part of the DVD is one of the Special Features. In additon to the usual director's commentary, the viewer can also eavesdrop on the surfers themselves discussing the movie as it plays. Listening to Greg Noll, Laird Hamilton & Jeff Clark pointing out the finer aspects of take offs, board design, & swapping anecdotes is truly a treat & not to be missed! So, "Riding Giants" isn't indispensable in the way "Dogtown & Z-Boys" is, but the DVD is certainly worth purchasing for the special features. You'll definitely be viewing it multiple times. A masterpiece. Stunning. Unbelievable. Inspiring...and downright merciless. My wife and I are skate skiers living near Tahoe and this movie, along with Step Into Liquid, was the perfect movie for a Saturday night in January after a day out playing in the snow. This review can't match the detail or eloquence of the spotlighted reviews. What I can say is that Peralta captures the passion that grips each of the surfers he interviews. What else but passion makes a guy paddle 45 minutes through cold Northern Cali surf to surf a monstrous wave that, if it doesn't drown him, can pound his body through a boneyard? And does it solo for fifteen years? That, my friends, is the passion of someone who loves what he does without any regard for glory or fame. May we all find that one thing in life that inspires us so. My only critique (one that I had with SIL and ES II, but that doesn't mean the movie is less than five stars) is that the movie lacks a discussion of the severe localism that plagues certain beach communities and is inconsistent with the surfing happy face presented here. The reality of Big Wave Surfing, is about living without fear. To hell with death. To hell with the fear of what might happen. This is about LIVING. All the song lyrics repeat this message over and over. The deeply spiritual message of RIDING GIANTS, is that the fear of death should not limit living, whether in play or work. Thus, the Chinese Proverb, saying "HE-WHO-FEARS-DEATH-DIES-A-THOUSAND-TIMES" comes to its culmination it big wave surfing. The SUN, WAVES, WIND, and being fully alive in the moment.....good grief. LET GO! This is Zen Buddhism, martial arts, Messianic fervor, Buckaroo Bonzai, and Larry-The-Cable-Guy... all in a package, SHAKIN' STONES! I am so pleased that "This is the sea" is the very first music on the CD, as it was the epitome of the documentary's music and statement. Mike Scott authored the lyrics with which "Riding Giants" is reprised. It sums up and affirms the comments by big wave surfer Dr. Rennekker in this powerful documentary, stating that big wave surfing is about TRANSFORMATION. I've seen Riding Giants over 22 times in the past three months, having ordered my own copy for deeper study several weeks ago. I was deeply impressed by the featured surfers, and also by magazine editor Sam George's comments about big wave surfing being a kind of faith. "It's about eliminating the B*S*." I'm not a big wave surfer, nor ever will be. I'm a chess player, another sub-culture, which like surfing, is said to sometimes be addictive. There are "waves" in chess also. Great big ones, when you are "in the moment, " balancing on a wave of energy and feeling, excluding all else, and you see a leverage move, and in the silent exuberance of your mind, focused entirely on the wavelike motion of little pieces on the the board, you say; "OH, MY GOD!" 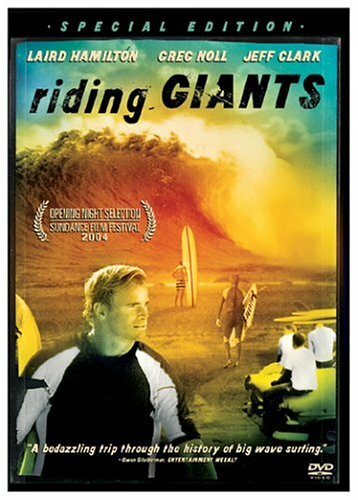 Such a moment is depicted in "Riding Giants" in regards to the killer wave ridden off the coast of Tahiti by Laird Hamilton in 2000. Big Wave Surfing is about a kind of mastery, about "letting go". This is not about the river. "This is the SEA, yeah...."
A recurring theme in Life, is that people are searching; searching for some kind of "connected" feeling. The sea is as deep a connection as can be found in the things of the earth. For this we sail, we swim, we leave home and go on "adventures". This is as powerful a documentary as I have ever seen. The span of time covered, all of the 20th Century and a little before, lends to the docummentary the air of a cultural phenomenon. Powerful, as much for what was not shown, as for the featured film clips of surfers. All the events of world history are a mere blur in the background. In the words of Mike Scott...that world is "...the river. THIS IS THE SEA, yeah! ", eternal, because this is about men and women on a board, with only a swim suit and courage. It's about the moment. It's the antithesis of our industrialized, mass educated, media-driven culture, riding glorious mechanization into the New Jerusalem, fearful that something might happen. The waves are free. The soundtrack is incredible. The soundtrack, the personalities, the phenomenon of personal transformation, the phenomenon of surfing itself, make this a documentary that will endure for decades. This is not about paddling out to catch 5 foot waves along some sunny Southern California coastline. This is about GIANT waves in excess of 20', perhaps as high as a hundred feet, that ....in the words of a young woman big wave surfer, ..." ...you have to just KNOW you're going to make it." It is not suggested that these unique individuals have done something for mankind; but what they have found for themselves is something that all of us can discover. This is the Sea. Yeah. I'm not a surfer, although I tried surfing once and got horribly sunburned. Until this video, that was the extent of my knowledge and interest in surfing. I caught the previews for this on the Discovery Channel and set the DVR to record it in HD. I started watching it, and my wife, who is usually not interested in this type of sports video, migrated into the living room and sat spellbound like me. The craziness of the early days of surfing, the board development, and the challenge to survive giant waves are woven into a fascinating documentary. The photography, especially shots taken from inside killer waves, is stunningly gorgeous. If you are a fan of Warren Miller ski films, this should be for you. I purchased the DVD from Amazon so I could share it with my children and friends. You really get to know the people who made the sport into an industry. The side stories really fit into the main theme very well and keep the interest at a very high level. It makes you feel like part of the family of surfers by the way you get into the lives of those who lived the surfing life. I live about 90 miles away from Half Moon Bay and when the Mavericks Surf Contest was postponed/cancelled this year, my wife and I took notice and even felt bad for the surfers who wouldn't be able to compete this year. If you want a video that chronicles the lives of some pretty wacky people who should all be dead right now but have survived because of their inventiveness. If you want a video that will hold your interest because of the story line and inspires you with awesome photography, get this one.